As communications professionals, we tend to be guilty of the very things we preach against: Speaking industry jargon and catchprases. On a daily basis, I tell my clients to keep it conversational. “Would you say it in person?” then don’t say it wherever you’re saying it. The terms “message development” and “storytelling” get bandied about quite a bit in our circles, but to someone who isn’t used to working with a marketing team, they don’t really understand what it is, and what role it plays in overall marketing strategy. Why on earth, you might ask, is there a line item in the proposal for message development? Why does it take so long, and why is it important? You just want to get going on the marketing. Message development plays a critical role in marketing. All this underground stuff: Research, analysis, and message development are the elements that build an effective marketing plan. The way your organization communicates your value proposition plays an integral role in how you are perceived in the marketplace. That means, stop saying, “We are the leading provider in state of the art widgets,” and start talking about the actual value you bring to your customers. No one cares what you say about yourself. They don’t believe you anyway. They want to know what’s in it for them. When you frame your messaging around the end-game to your customers, it changes the entire approach to your plan, and here’s the thing: It doesn’t end with a tagline. It drives the entire customer experience from your website copy, to email marketing, to your content strategy and your print ads. Everything. How can you get someone fired up about your business? Don’t tell them what you’re going to sell them; help them understand how their lives will change for the better when they become a customer. Selling has become taboo. We don’t sell anymore. We seduce with emotional connections. Evernote: Remember everything. Capture anything. Access everywhere. Find things fast. These are the messages they are delivering first and foremost. Using active verbs, that immediately appeal to their very busy target audience, they focus on their needs over Evernote’s features. 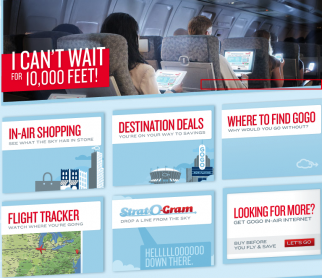 GoGo Inflight internet: “I can’t wait for 10,000 feet.” GoGo Inflight creates excitement and anticipation for something that is considered drudgery to business travelers. Basecamp: This project management software platform relies on social proof and testimonials to get you hooked. They could say, “we are a leading provider of project management solutions for ….” Instead, they show someone (just like you and I!) with a big smile, telling us how she uses Basecamp. Nordstrom: Sorry if you’re tired of hearing me write about Nordstrom but they are a brand I love. They consistently over deliver on service. This is an example of a message platform that permeates their very culture from the way their sales people help you in the store, to their generous return policy and to the website experience which is built around the customer. Search and categories features allow customers to shop on their own terms, the way they want to. Developing the message platform is based on research. What exists in the marketplace now? Where is the gap in supply? What is the outcome for your consumer? The end game? How does this translate to a story that makes an emotional connection – that builds anticipation and excitement, and creates a “need” rather than a “desire?”The message platform is the guideline that informs the company boilerplate, website experience, social media interaction, customer service, and training. It drives your SEO because it’s done in a way that solves your customers problems, and therefore is naturally keyword rich. Good messages do what GoGo, Basecamp and Nordstrom have accomplished. They create an emotional connection, show buyer benefit rather than product feature, and focus on customer experience. So? What do you think? Tell me about good messaging you’ve seen. I wanted to include MailChimp because I think they do a great job of creating a connecting with their audience, but I’m getting garrulous so I’ll stop now.